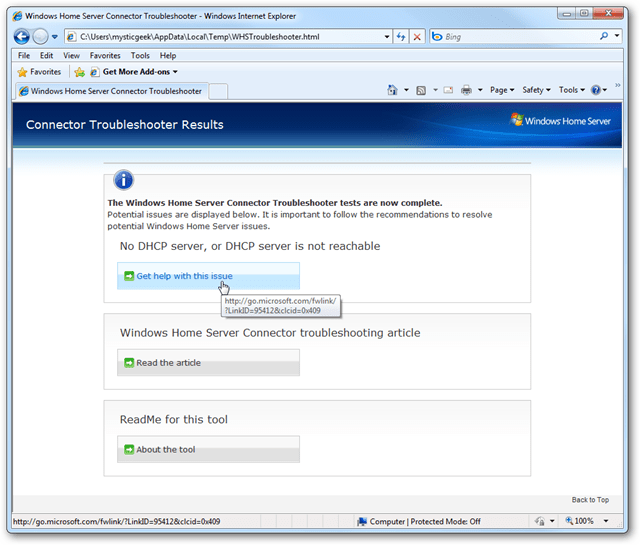 If you’re experiencing slow connections or none at all to your Windows Home Server, a good way to help diagnose issues is with the Windows Home Server Toolkit. Today we take a look at the toolkit and see how it can help you get your connections back. 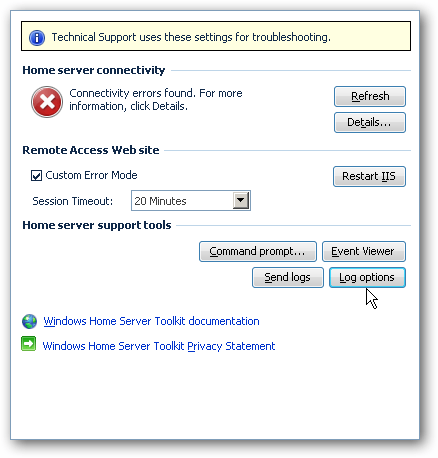 The WHS Toolkit is an easy to use utility that will help you find out what is going wrong if computers aren’t connecting to your home server. Simply download and install the toolkit on any of the machines on your network that aren’t connecting properly. 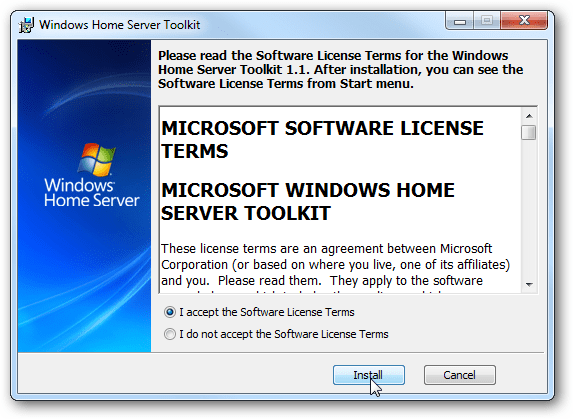 For this example we installed the toolkit on a Windows 7 machine and after installation you’ll see it listed in the Start menu. The first thing we need to do is publish the add-in over to the Home Server. 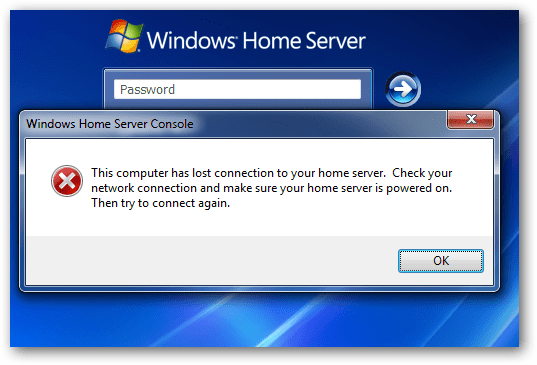 After it’s copied over you’ll receive the following message stating that it needs to be installed on the Home Server. 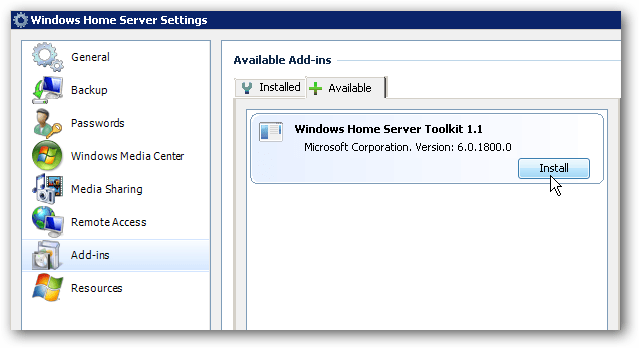 Open up the Home Server Console and click on Add-ins then the Available tab on the right then Install. You’ll receive a message indicating the installation was successful and that WHS Console will close. WHS Console closes and you’ll see an error that connectivity has been lost… that is normal just click Ok.
Now you can use the toolkit to help troubleshoot network issues. Go to Start \ All Programs \ Windows Home Server Toolkit then launch the Connector Troubleshooter. 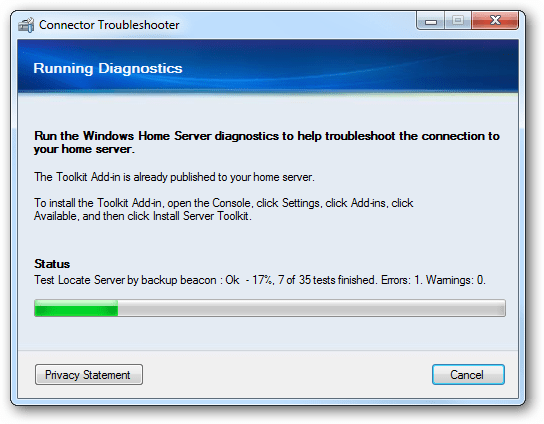 The troubleshooter gathers data and tries to help diagnose connection problems. It doesn’t make changes to any settings on your computer, but does help detect issues and find solutions. After it’s complete you’ll get a report that opens in your browser and points out any issues it found. It might point you to a driver or software that needs to be installed, a Knowledgebase article, Windows Updates…etc. There might be times when you’re asked to send these logs to tech support, copy the logs to the server, or control other options. 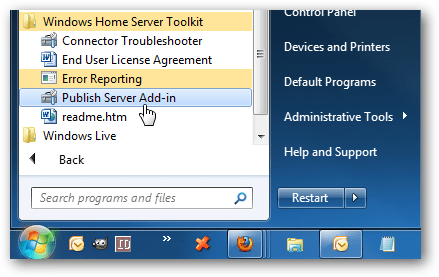 You can do so from the WHS Console under Home server support tools. 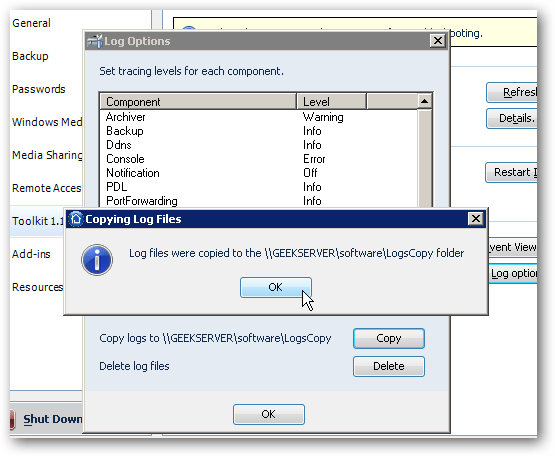 For example here we copied over the log files to the server. While the method above is easy and should help most people who need it, you can also run it in Advanced Mode. This allows you to see the tests that the troubleshooter performs and can give you a better idea of any potential problems. To run it in Advanced Mode go to Start \ Run type cmd into the search box and hit Enter. 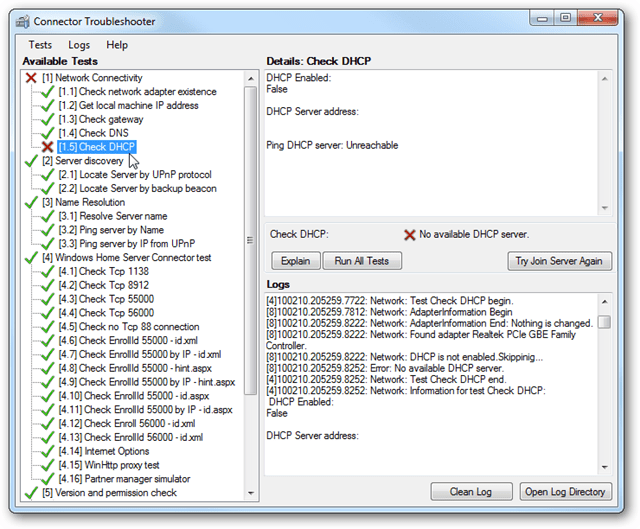 The troubleshooter opens in Advanced Mode…click Run All Tests, enter in the server password, then get detailed information on each test that’s been performed. This can be used to help solve connection problems and for sending error reports to tech support. You’ll need to install the toolkit on each machine that you’re tying to troubleshoot and it runs on XP SP2 and higher. If you’re having problems connecting to your home server, this toolkit can come in very handy for beginners and advanced user alike.